The Golden Knights defense looks light years better with Theodore back in it compared to when he’s out waiting to come to a contract agreement. Eventually it’ll get done and he’ll jump right back into being a key cog in Vegas’ balanced D corps. Unfortunately, that doesn’t necessarily have to happen prior to opening night, which may leave an extra spot open for a young player to come in and steal the spotlight. Theodore was the prize defensive prospect all last year and he proved worthy of the praise, but if Erik Brannstrom gets a shot and thrives, Theodore’s worth may diminish a bit in the grand scheme of the Golden Knights long-term needs. I recently asked Holden why fans of every team he’s ever been on seem to hate him. His answer was interesting, he essentially said it’s because he’s not flashy or risky and because of that he tends to be the last man back on odd-man rushes (Likely a full story coming on this soon). However, Golden Knights fans should have high hopes for Holden in Gallant/McGill’s system. He’ll be asked to play a simple game and use his skating to help transition the puck from D to O. He’s good at that and his willingness to play on either side on defense makes him even more valuable. At some point, Father Time is going to catch up to the Vegas native, but that hasn’t happened yet. As of right now, he’s still the Golden Knights most reliable defenseman. He’s not going to give much on the offensive side but when it comes to penalty killing and late game tied or leading situations, Engelland is still the go-to guy. With Schmidt out, his minute load is going to skyrocket, hopefully, it doesn’t burn him out. After a tremendous effort in the second preseason game and a rookie showcase in which he was undisputedly the defensive player of the “tournament,” it’s time to put Brannstrom not only atop the list of prospects but pushing for a roster spot out of camp. There’s still a lot he needs to learn, but the Golden Knights might just be in a spot where they’ll be willing/able to let him learn it at the NHL level rather than being safe and throwing him to the Wolves (Get it?). He’s got to keep up the pace he’s been on through the next two weeks though to earn that spot. Any little slip up could cost him because McPhee isn’t going to want to keep him around unless he is absolutely 100%, without a shadow of a doubt, positive he belongs on the roster. There’s not a ton to say about Merill outside of just calling him steady. He’s never going to be the best player on the ice, but he’s also not going to get beat by the best player on the ice too often either. Despite being number eight on this list, you can pretty much call him a lock to be on the 23 man roster on October 4th. This is a bit of a weird spot to be in for Whitecloud. He hasn’t yet risen to the ranks of Merrill, Engelland, or Holden, but by the numbers, he certainly deserves a look at a roster spot. Unfortunately (for him) he’s probably going to be on the outside looking in due to the fact that he doesn’t have to clear waivers and Brad Hunt and Jake Bischoff do. Said this before and I’ll say it again, Brad Hunt is the perfect 23rd man on an NHL roster. He’s unquestionably competent enough to step in and have an impact on a game when needed, but he’s also an awesome person to have around in the locker room and on the ice after practice with the healthy scratch players. Because of this, expect Hunt to make the roster at the expense of a player who might be able to further develop their game at the AHL level. 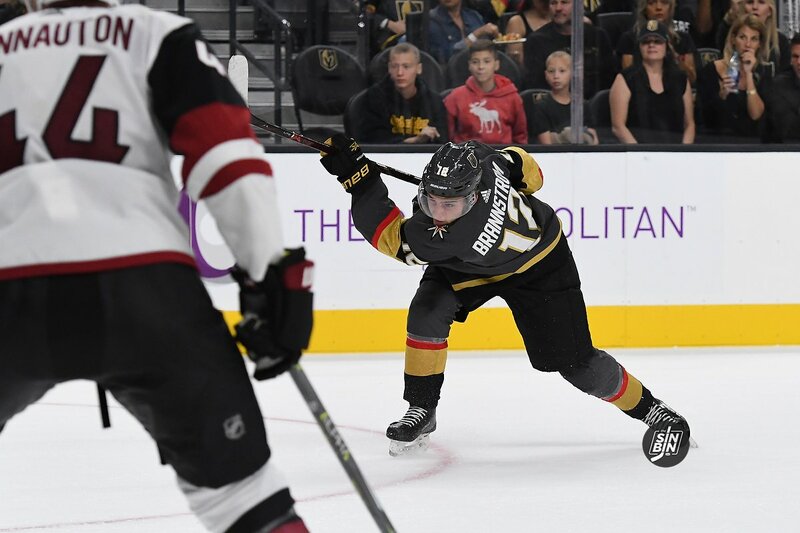 Bischoff was the final piece of the fruitful trade that netted the Golden Knights Erik Brannstrom (2017 1st Round Pick) and a 2019 2nd Round Pick. He was one of the best defensemen with the Chicago Wolves last year and has impressed early in camp and looked good paired with Nin Hague in The preseason opener. He and Zac Leslie will likely get into more games soon and will be battling it out for that eighth and final spot if Theodore is out and McPhee opts to use the waiver exempt status on Brannstrom and Whitecloud. Like Bischoff, Leslie hasn’t seen action outside of City National Arena, but in the scrimmages there he’s looked confident, composed, and reliable. He’s not a flashy-type defenseman, but he could be the kind of player that has an upside the Golden Knights would like to see if they can develop quickly at the NHL level. He’ll have to do some good work in any preseason games he plays in to make it happen, but Leslie is not as far out of the picture as most would suspect. Listen, I like Nic Hague a lot, like way more than I did before Rookie Camp began, but he still just doesn’t quite seem ready to be playing NHL minutes at this point. Could be in the picture as the seventh or eighth guy on the roster, sure, but sitting in the press box isn’t helpful for a 20-year-old who has a lot to work on. He should go to Chicago, play big minutes in many different situations and soak up as much knowledge as he can. This guy is going to be an NHLer at some point, probably sooner than later, but not out of this camp. The fact that he’s right-handed is likely a huge factor in why he was one of the few undrafted players the Golden Knights signed last year. He’s a reliable defenseman that has the ability to pinch in when the time is right. Expect him to be a good player with the Wolves but not put up much by way of statistics. Not quite ready to say he’s a surefire NHL player someday, but he’s a better bet to get a chance at some point than not. At this point, it appears we know what Reinhart is, and unfortunately, that’s not an NHL caliber player. The physical tools are still there, they are the reason he was the #4 overall pick in the 2012 Draft (ahead of Filip Forsberg, Zemgus Girgensons, and Andrei Vasilevskiy just to name a few), but it just hasn’t panned out and it doesn’t seem like it’s ever going to. Can’t say I’ve seen a lot out of Oligny in scrimmages, but that’s also probably a product of the focus of my attention as well. He may draw into the lineup for a preseason game this week, or he might be re-assigned to Wolves camp before the week is out. Either way, don’t expect to see a huge jump from this 25-year-old who has still yet to make his NHL debut. Good stuff here. One thing: Bischoff played in Sunday’s game (23 min). He scored and was +2. Brannstrom is quite impressive. I can’t wait to see him in a couple more years. No reason to believe he can’t improve to a very high level. Would Brannstrom develop more with the Wolves instead of with the 3rd line of the Knights? Would get more minutes, albeit with lesser competition. Though being on the 3rd line may allow him to apply more effort in 13-14 minutes instead of 20-21 minutes. Or what about Holden – Brannstrom on the 2nd line and Merrill – Engelland on the 3rd line? I think you are rating Miller too high, he is no higher than 5. Yes he has scored 41 points but was a -4 in his plus/minus, weak defensively, Brannstrom needs to be on 1st line for the Wolves to develop this year.